The Tannoy Monitor Golds sound better than ever, no need to change more. The overall sound image is cleaner, it has less distortion and less colouration. My Monitor Gold 15's never sounded so well. Specially voices are natural and sparkling, also the separation between the instruments, in for instance an orchestra, is better. The only disadvantage is that bad recordings sound worse than before, errors made by recording engineers and record manufacturers are to be heard more evident now. Noise, hiss, rumble and distorted s-sounds in voices can be quite annoying after this modification, the limitations of the today recordings can be noticed quite well. Another remarkable improvement is that the difference between traditional vinyl recordings and cd's is noticed better, it clearly shows the advantage of analog sound processing, the digital recording techniques have to catch up the coming years. a. Scrap the switches of a Monitor Gold's crossover network now, they are the cause of severe distortion. Mine even produced a rattling noise. b. If you can get better capacitors, replace the electrolytic ones, colouration of the sound is reduced dramatically, depending on the quality of the new caps used. c. If you can get better capacitors, replace the 6.8 uF ones, high frequencies get freshened up substantialy, sound gets more clear and crisp, depending on the quality of the caps used. d. Remove the external multi-wiring of the crossover network (between panelswitches and crossover, leave the wiring between crossover and speaker, leave also the speakerconnector) and replace it with decent copper* wiring capable of handling 100 Watts, the lows get better considerably. *(do not use silver wire because of corrosion and soldering characteristics, do you have experience with the Hitachi transistor 2SC460 in for example Luxman tuners? If you do, you know what I mean). Above you can see the curves as specified by Tannoy, of the Monitor Gold 15 and HPD385(A) Dualconcentric speakers, scale is 5 dB. Below the overall characteristics of the Monitor Gold 15' chassis. Both speakers have similar overall open-air characteristics, as you can see the usable chassis frequency response is from 50 Hz to 20 KHz. Below the specific frequency response of the #115760 speaker, in the 200 Litre closed cabinets. The #129969 speaker has a similar curve. This is a calibrated graph. As you can see the response is within +/- 3 dB from 45 Hz to 20 KHz, notice the slight dip around 40 Hz, probably caused by room characteristics, the slight dip around 300 Hz and 2200 Hz are typical for a Tannoy Dualconcentric. 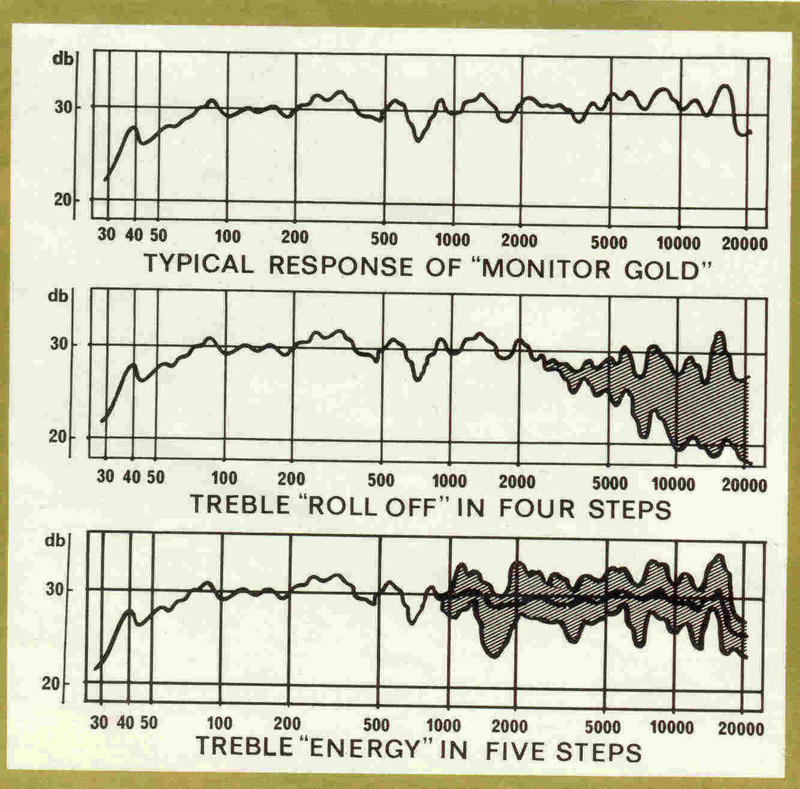 Resonance frequency of the system is clearly at 32 Hz, that is damped correctly. 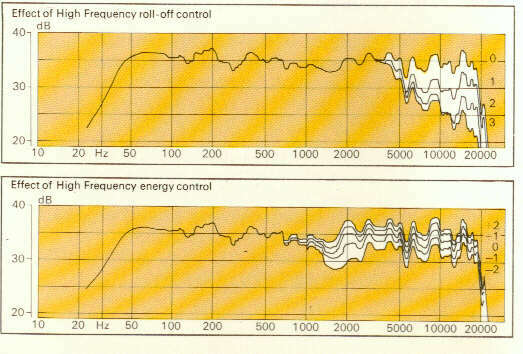 Usable frequency response of the system is from 30 Hz to 20 KHz. The measurements were made in SPL-mode, at 1 Meter, 1Watt input, in a normal listening room, so keep in mind that certain reflections and resonances can influence the measurements, scale is 5 dB. Equipment: Analyzer: Neutrik AG Switserland. Sinesweep and wobblesweep modes. Matching calibrated microphone: Peerless condenser Danmark. Below we report another 2 measurements on 2 Kef speakers the model C55 and 103.2. This is to compare with Tannoy and satisfy curiosity. 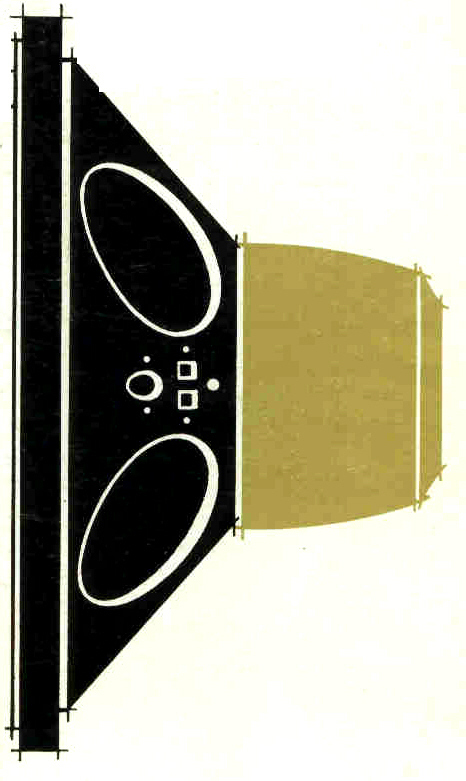 The curves were made under the same conditions as the Tannoy curves. Below the C55 UniQ is explained. The Kef model C55 is a coaxial speaker system with an extra passive bass radiator. It is a two way system with a simple crossover filter. The volume of the cabinet is approx. 30 L. The tweeter is not horn loaded. As you can see this curve is better than the one of the 103.2. It has a more usable frequency response, although the dip around 200 Hz is present it is less severe. We think the plastic LF cones of both models are the cause of this dip, scale is 5 dB. Here what we got out of the Neutrik: quite different from the specs of Kef. The Kef 103.2 is a conventional 2 way system, with closed cabinet of approx. 30 L. with a tweeter and a woofer. Notice the roll off above 5 KHz and the severe dip of approx. 10 dB at 200 Hz, scale is 5 dB. The crossover employs only electrolytic caps. and ferrit cored coils. Below you can see an example of the way Kef makes xovers: this is a 5 (!!) way xover, loaded with R's, electrolytic caps, ferrit cored L's and some other components. Read on at the previous page, click here. © Hans Hilberink PE1MMK & Laurent Martin 1970-1971-1996-2002, last update: 19-09-2006.